Today, we are in I Thessalonians for our Bible journaling page. It’s a simple and amazing passage. I have seen some amazing benefits to writing Scripture in the last two months. Scripture has been on my mind so much more than when I just read it. Habits of Bible time and prayer have been firmly established. The most exciting part, however, is the spillover effect. I am enjoying writing Scripture so much that I have been trying to fit Scripture into other parts of our day, too. We have been able to develop the habit of an evening Bible study as a family. This has been so difficult to maintain in the past. The kids have even started copying Scripture! I want to encourage you to take the time to start copying Scripture if you haven’t already. I want you to start reaping the amazing benefits. Now, on to this specific passage. As a quick note, I have been asked what Bible translation I use. I would first like to point out that all the English translations are just that, translations. I was previously taught that KJV was awe-inspired, and all the other translations were right from the pit of hell. I currently use several translations because I see value in comparing them. For reading, however, I prefer the ESV. It has a nice flow for reading, particularly out loud. Our children’s Bibles are also in ESV. 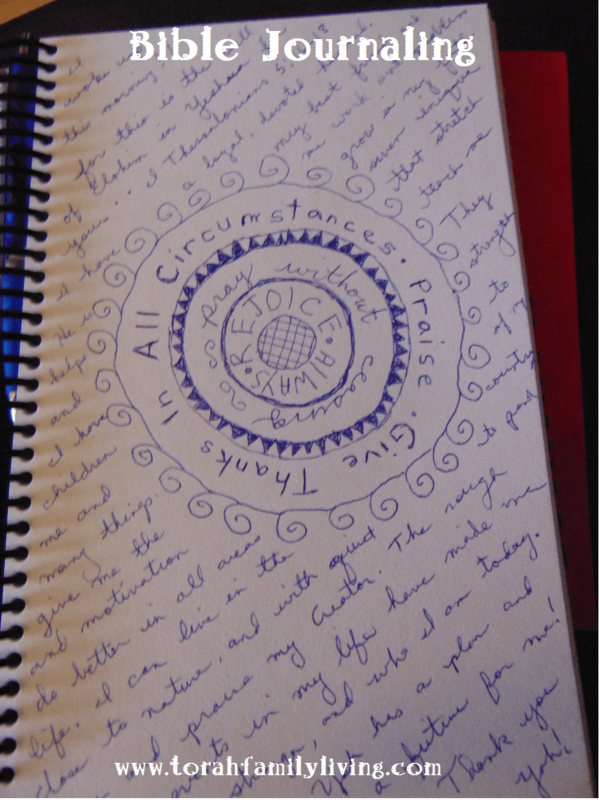 I wrote this verse in a circle, because it made me think about rejoicing around the clock. Many verses can be written in a similar way. If it’s talking about a mountain, for example, you could write it in the shape of a mountain. It’s simply another way to help you remember the verse, and ultimately, apply it. This was a great passage for adding journaling, since it was so short. I found myself with plenty of room, and it seemed a shame to leave it blank. 😉 I wrote several things I’m thankful for in the background. Feel free to have fun with it like I did by writing it diagonal. On other pages, I simply used the space at the bottom of the page. Writing your response to the verse has two purposes. It helps you to use Scripture as a mirror and evaluate yourself against it. We should come away from Scripture changed to match it. Writing down your thoughts can be very helpful for some people. If I just think about the verse, I can pretend those thoughts didn’t happen. Thus, I require less of myself, which brings me to the second purpose. My Bible journaling is in a notebook, and I find myself flipping through and reading the verses I already wrote. I read my responses, too. I am reminded of the lessons learned, because I wrote them down. This actually happened by accident. I needed to occupy a few children, so I asked them to copy these verses down, and then decorate them any way they liked. Holly copied them down and then drew YHVH holding her in His hand. She was thankful for His watchful care. Sadie copied it and drew several things she was thankful for. It occurred to me that if writing Scripture is beneficial for me, how much more for my children? Make an effort to include your children in this project. Have them copy a verse while you are fixing dinner. Let them make a Scripture sign to hang on their door. If they enjoy this, let them have a notebook like yours. It is of such value to put Scripture into your children’s hearts and minds. How about you? Have you been journaling along with us? What benefits have you been noticing?